I have been waiting to hear the words out of his mouth before commenting. It finally happened this morning - Donald Trump announced via Twitter (how else?) that Indiana Governor Mike Pence is his choice for Vice-President. All that it takes now to make it official is for that decision to be confirmed by a majority of delegates at the upcoming GOP national convention. A mere formality. To run for Vice-President, Pence had to withdraw as the GOP nominee for Governor. Pence doing so this morning sets off a scramble in the Indiana political scene. Pence's replacement on the ballot will be chosen by the Indiana state committee which is made up of two representatives from each congressional district. While many names have been floated as replacements on the ticket for Pence, it appears that current Lt. Governor Eric Holcomb may have already lined up enough support with the state committee. Other names mentioned include Speaker Brian Bosma and Susan Brooks and Todd Rokita, both Hoosier members of Congress. The Indianapolis Star is now reporting that both Holcomb and Brooks are officially in as candidates to replace Pence. Although Pence has fallen out of favor with many Hoosier conservatives, the fact remains that he remains very popular with conservatives outside of Indiana. As such, he will certainly shore up the Trump ticket some on the ideological front. But as far as making a difference in the race, exit polls shows who is No. 2 on the ticket rarely matters. At best a vice president can usually help the presidential candidate win the Veep's home state and that's about it. But I'm not certain that the selection of Pence makes a difference in Indiana when it comes to Trump. I expect that Indiana may end up being competitive, much like it was in 2008 when Democrat Barack Obama won the state against Republican John McCain. As far as Pence goes, he is risking his political career.Every racist, sexist, xenophobic and utterly stupid thing comment uttered by Trump, and there will be many such statements, will tarnish Pence's reputation. Many quality VP choices took themselves out of the running because they didn't want to risk their political careers by being associated with Donald Trump. But then on the other hand, VP selections are often considered the next in line when the Presidential campaigns go south. Witness Jimmy Carter's selection of Walter Mondale as VP in 1980.Mondale became the presidential nominee in 1984 against Reagan. Of course, that did not end well. It could be possible that during the presidential campaign Pence will appear as the voice of reason compared to the unreasonable Donald Trump. To accomplish that, however,would require Pence to promote Trump while at the same time somewhat distancing himself from the New York businessman's more outrageous comments. Not sure Pence can pull that off. It's certainly been an interesting political season so far. Maybe too interesting. I do not believe that this was a decision that Trump made all on his lonesome. Trump and Pence are extreme polar opposites on many issues that drive Trump supporters. I also do not believe this pick will make a wits bit of difference with evangelical voters who have now come to realize they are not electing a preacher to the Presidency. If they wanted a preacher then they would have bought what Cruz was selling but they did not in sufficient numbers enough to make a difference. I'm not saying that that the church vote won't count in key southern States but Trump ran the table in those in the primary. As simplistic as it may seem, I would argue that money was the motivating factor and Trump just sold out. How Trump's so called base wants to deal with that we'll wait and see. Agee with Anon 2:33 on evangelical voters committed to Trump; whose selection of Governor Pence is an election strategy to solidify several midwest states including Indiana, even PA won't be a surprise. This ticket could / should landslide Shrillary; whose accomplishments are what?!? The challenge for the "Republican Party" if it's to continue, is one of 180° reverse course on statism. We need Net Cons; Net Constitutionalists & Net Conservatives; people who reduce the morbid girth of statism's counterfeit "government." So, Trump wishes to win. Mike offers him the best chance of so doing. Sure, conservatives like their candidates to be pure and will be critical of heresies.... http://thefederalist.com/2016/07/14/mike-pence-makes-a-good-match-for-trump/?utm_source=The+Federalist+List&utm_campaign=0c6dd7ed79-RSS_The_Federalist_Daily_Updates_w_Transom&utm_medium=email&utm_term=0_cfcb868ceb-0c6dd7ed79-83837897 It doesn't get much clearer than this talented lady as to why conservatives have been less enchanted with Mr. Pence. But, just as there is no point in arguing reality against a liberal (who does not believe in reality or truth) the facts are that conservatives do care about getting things right. You want sparks? Have conservatives argue...and, they do. There are many strands of conservatives not all of whom are learned but learning is something a lot of people can acquire and misuse and be misled by. Cruz will be speaking at that Republican Convention and a whole lot of people will tune in for his speech. I'd think Mike ought also to be in for a major speech-it is a thing he does well. For some reason I feel somewhat betrayed. 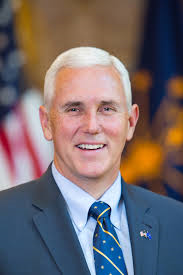 IN voters chose Mike Pence to run for governor 1 more year. He made that commitment to us. Now he's dropped out for a career advancement. Pence chose Holcomb, after pushing Elsperrmann out the door, to run as LG to make sure Stutzman wouldn't win the US Senate race. Holcomb's not really a nice guy. He was Daniels henchman for several years and stuck his nose into business that wasn't his. He was a poor state chairman at best. He has never held a real job that I know of and he married into money. Rokita was SOS for several years and then congressman because Dan Dumezich and Bob Grand (part of the good ol boys club) raised money for him not because he's a good public servant. IIRC Charlie White started uncovering some stuff on Rokita when he mysteriously was found in the middle of a weird vote fraud case that ruined his career. Did Dumezich, Grand, Rokita tip off democrats to file a complaint that White voted from his exwifes house instead of a new condo he had just bought with a new girlfriend? Which led to a huge vote fraud case and ultimately removal from office and loss of lawyer license? Which leaves us with Brooks. Don't know much about her except what I have read and I don't like it. So now We have 22 people choosing one of these picachues to run as the republican candidate. I think I'd rather take my chances with Gregg. I am not at all surprised RINO corporate-owned tool John Boehner's twin and faithful sidekick, partisn political hack Susan Brooks, and that awful money-motivated rent a civic leader Eric Holcomb who never saw a public financed crony scheme he didn't try to personally cash in on, a gunning for more power, money, and prestige. These two are like flotsam after a boat wreck. I'll never vote for a real Democrat again but I sure as hell will never vote for fake conservatives like these David Brooks' wife or Eric Holcomb. And Brian Bosma really beleives he is gubernatorial material when his allegiance to insider special interests in the state legistlature proved him to be a politifal prosititute to good governance? Forget it. The entire State GOP and the MCRCC groups must be napalmed and rebuilt. And what exactly are Trump's "accomplishments?" Here are a few that I can think of though, I would hesitate to call them "accomplishments." *Inherited $100 million from his father. *Fooled a bunch of gullible voters into thinking he, a life-long liberal, is a conservative Republican. That's just a partial list. I really think only the last one is an accomplishment. I think you give far too much credit to what a VP can do. Hillary is going to win either fairly easily or in a landslide. The big thing is that Trump is going to turn a lot of states that were once solidly red into blue states.